Like Gameloft games? Like social networks? Like to combine things you like with other things you like? You're in luck - the Gameloft LIVE! app for Android does just that. 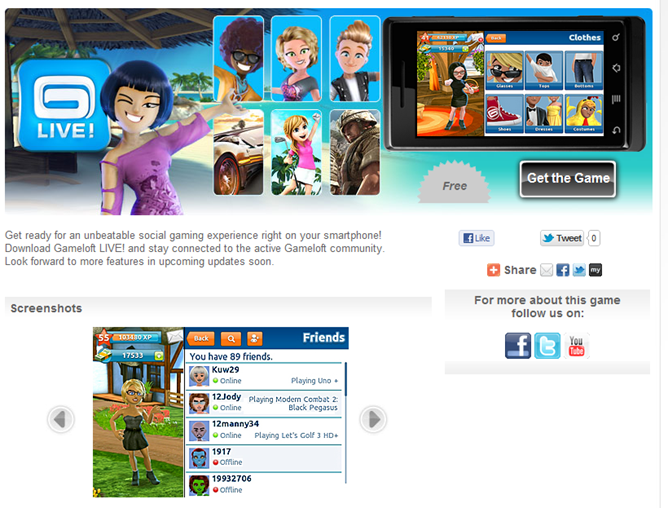 Think of it as a social network exclusive to Gameloft gamers. Oh, the possibilities. Here's the skinny: you can create a custom animated representation of yourself (read: an avatar), kick it with your homies (read: chat with other players), increase your gamer rep and earn respect (read: gain experience and score Gameloft coins), get cheap games (read: discounts only for Gameloft LIVE! Members), and a lot more (read: and a lot more). The app is available for free in Gameloft's store, so head over there and grab it while the grabbin's good.